InstChoco - The ULTIMATE Chocolatey and Chocolatey packages (re)installer! 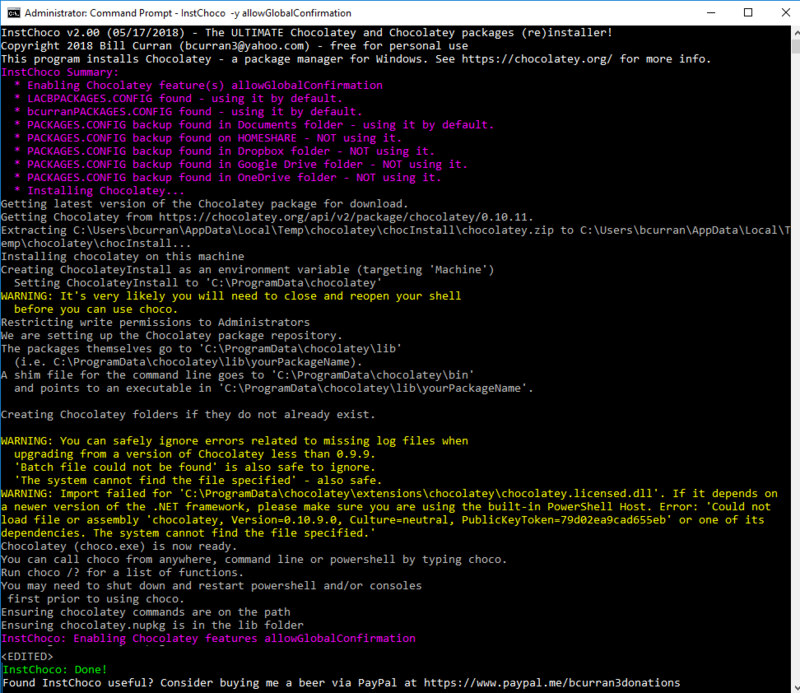 QUESTION: "Why do I need an installer for Chocolatey when I already have Chocolatey installed?" 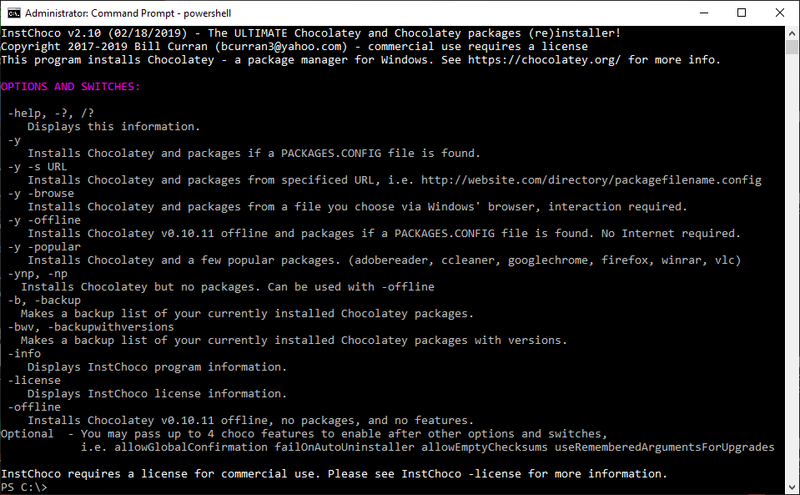 ANSWER: You need InstChoco for the NEXT time you want to install Chocolatey and automate package (re)installation! InstChoco is the evolution of an old batch file I’ve used over the years to automate installing Chocolatey followed by a bunch of "choco install packagename -y" commands to install my standard toolset of programs. In 2017 I turned that old batch file into a program with many additional features. Thus, InstChoco was born. I also integrated InstChoco with other Chocolatey packages I've created. InstChoco is especially useful when used along with Choco Package List Backup to Local and Cloud. What you see now is the culmination of many long hard hours of work making InstChoco the ULTIMATE Chocolatey and Chocolatey packages (re)installer! InstChoco is extremely feature rich, but I'm always open to new ideas and features. Feel free to contact me with feedback or suggestions. To download InstChoco directly, click here. 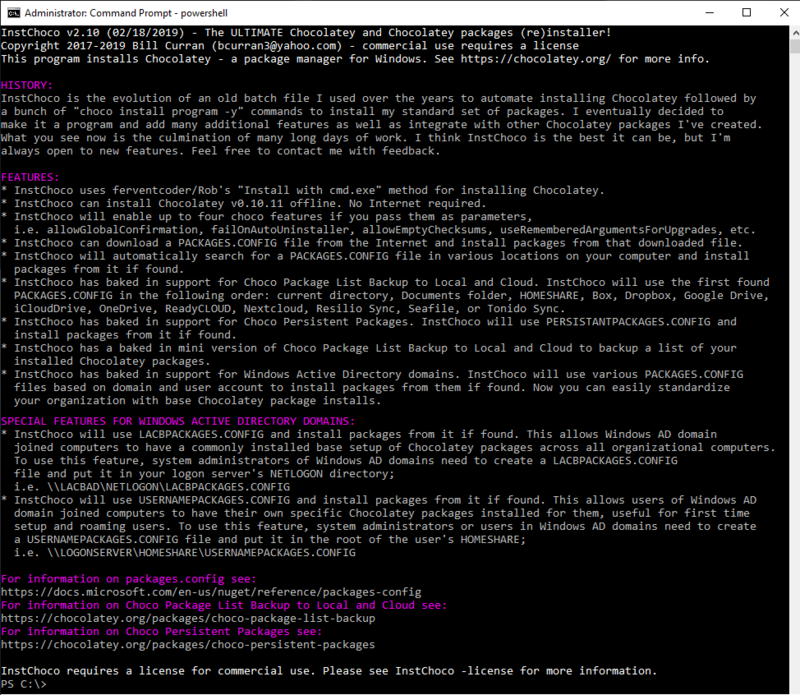 This InstChoco Chocolatey package was uploaded by the author, Bill Curran aka BCURRAN3. InstChoco is Copyright 2017-2019 Bill Curran and is free for personal use, though donations are encouraged. Commercial use of InstChoco requires a license. A limited 5 day non-production evaluation is permitted. their organization's name embedded in the program and without corporate nag screens. 2.10 - Added -offline Chocolatey install option. 2.02 - Removed legacy date checking and connectivity checking which only worked in English environments. 2.01 - Fixed bug with non-domain joined computers. 2.00 - Added -browse, -popular, -backup, -backupwithversions, -license options as well as many cosmetic changes. Added iCloudDrive support. Commercial use of InstChoco v2+ requires a paid license. 1.30 - Added ability to download a packages.config file from the web and install packages from it. 1.21 - Added Box, Nextcloud, and Seafile support to catch up with choco-package-list-backup. 1.20 - Added domain support to install predefined packages for domain joined computers and user specific packages. This discussion is only about (unofficial) InstChoco (Portable) and the (unofficial) InstChoco (Portable) package. If you have feedback for Chocolatey, please contact the google group. Tell us what you love about the package or (unofficial) InstChoco (Portable), or tell us what needs improvement. Deployed from e27d7a207f. You are on web.3. UTC time is currently 22 Apr 2019 11:19:18 +00:00.